The Big Hole Visitors Center. A ‘hole’ new experience ….. You’ll dig it! 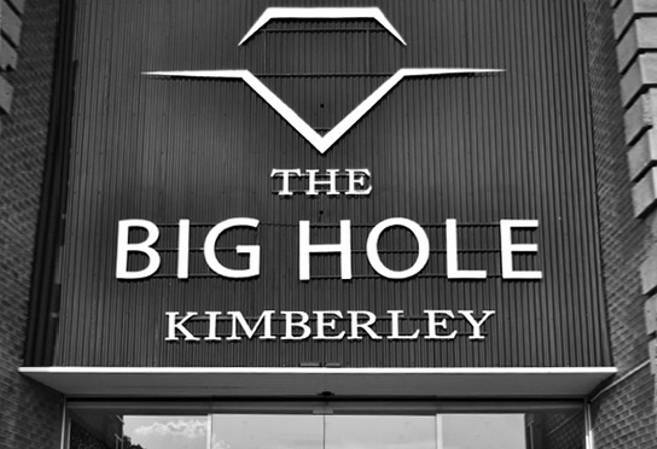 A visit to the Big Hole will transport you back in time to the very beginning of Kimberley and the discovery of Diamonds. The Big Hole is a massive man-made excavation, 214 meters deep with a surface area of 17 hectares and a perimeter of 1.6 km. Entrance to the complex is free of charge but fee are charged to enter certain areas. The Old Town brings the New Rush era to life, where the hopeful, the desperate and the determined flocked to the town of Kimberley to seek their fortunes. You’ll discover period buildings that have been preserved or restored to their original glory; these include a church built in Europe and shipped to Kimberley, Barney Barnato’s boxing academy, the digger’s sleeping quarters and the De Beers railway coach, used by Cecil John Rhodes to commute between Cape Town and Kimberley. Digging commenced at the Kimberley mine site in 1871. By the time mining ended on 14 August 1914, the mine had yielded 2722 kilograms of diamonds, extracted from 22,5 million tons of excavated earth. Today what remains is a massive crater 214 meters deep with a surface area of 17 hectares and a perimeter of 1,6 km. It is surrounded by original buildings from the heyday of the mine, relocated from earlier sites to form an unforgettable open air visitor experience. Through an investment by De Beers Consolidated Mines, numerous attractions had been added to the Big Hole facility – a world-class tourist destination, providing unique insights into diamonds, diamond mining and the process of recovering rough diamonds right through to the polished gem found in today’s jewelry. With the development and ongoing improvements to the N 12 national road, visitors are encouraged to take an alternative route through the breathtaking Northern Cape and to come and explore the wonderful attraction that is the Big Hole in Kimberley. The Big Hole facility also has numerous shops catering for all tastes. De Beers has been mining in Kimberley for more than 120 years. The recent closure of underground operations at Kimberley Mines marked the end of underground mining in Kimberley, as we know it. De Beers’ presence in Kimberley continues, however, in the processing of the tailings resources through the multi million rand Combined Treatment Plant, as well as the Big Hole Project, a unique and exciting way for De Beers to invest in tourism activities, ultimately supporting the communities that surround Kimberley Mines. When the De Beers board took the decision to invest R50 million in developing the Big Hole into a world-class tourism facility in November 2002, it based the decision on the rationale that the project is in line with the company’s philosophy of creating a lasting legacy for the people of Kimberley that will generate jobs and business opportunities where the company operates. De Beers’ investment in the province through this development project is an indication of the company’s commitment to social responsibility and leadership in the quest to create employment as part of the national effort to eradicate poverty. The Big Hole project has already created some 400 jobs during the construction phase. On completion it is anticipated that it will support a significant number of permanent jobs in the region. The scope of the Big Hole development lent itself ideally to an integrated public private partnership between the provincial government, the Sol Plaatje municipality, Frances Baard District Municipality, Northern Cape Tourism and De Beers. These key players in this successful partnership enabled the project to capitalise on the synergies and strengths of all the stakeholders and to contribute positively to the project for the benefit of all in Kimberley and in the Northern Cape. It is not impossible that this successful public private partnership will, in time, be held up as a model for other public private partnerships in South Africa.The R50 million Big Hole project has been a robust vehicle for De Beers to support business based in Kimberley through the local procurement of goods and services and in particular black economic empowerment companies. Of the R50 million approximately R23.7 million or 48% was spent with BEE companies, while some R30.3 million or 61% was spent locally , of which over R18 million is with local BEE companies. Tswela construction, a Kimberley-based BEE construction company did most of the Phase 1 construction work. The first phase of the development project included the refurbishment of some of the existing buildings into a 13-roomed guest house (R2.3 million), a car park (R3.8 million) and other entertainment facilities all amounting to R16.8 million. The second phase of the project, amounting to R32.91 million was the development of a visitor centre which focuses on the story of the Big Hole, De Beers and diamonds. The creation of further retail opportunities, an upgraded viewing facility and a spectacular, world class display of rough diamonds is also included.There is a clear rationale for De Beers’ involvement in the Big Hole Project. Even before De Beers has exhausted all ways of optimizing and extracting value from its diamond resources in Kimberley, the Big Hole Project is expected to contribute to sustaining the Kimberley community and assisting them to move from a mining-based economy to one based on tourism. The new facility is expected to double visitor numbers to the Big Hole. This will in turn be of benefit to the Kimberley communities and the Northern Cape as a whole.The Big Hole Project was born as a result of De Beers’ enduring business philosophy: to make profits for our shareholders, but to do so in such a way that our commercial and mining activities provide lasting and significant benefits to the communities which host our operations. The initial De Beers investment of R50 million was therefore the catalyst for what could add up to a potential R300 million in further investment in the area around the Big Hole.The creation of small business opportunities within the Big Hole development has been a priority, with 13 new small businesses established. Importantly, these businesses are all owned by people living in Kimberley and its surrounds, and an empowerment ownership level of 60% has been achieved. This implies that the income derived from these businesses will remain within the economy of the Northern Cape, with the resultant benefit to the local community. By providing access to mainstream tourist activity, exposure to key markets will result in the growth of the small businesses. The Big Hole project is a living illustration of the way a major natural resource, namely diamonds, is contributing to the transformation of Southern Africa and the lives of its people. Revenue from the sale of diamonds is a key source of income for South Africa and several Southern African nations. Southern African countries have driven significant improvements in their country’s infrastructure, health services and education systems through the revenue generated from the sale of diamonds. Articles about The Big Hole, Kimberley on the Kimberley City Information Website. View all events in "The Big Hole Centre"